(Three Units Available) – Each unit has two bedrooms. One bedroom has a queen bed and the other has two twin beds. There are four twin beds in the loft. Each unit has a kitchenette with stove top, microwave and dorm-size refrigerator, dining area, living room and bathroom. Linens are provided. Lodge is a three bedroom, two bathroom with living room, dining room and kitchen. Two bedrooms have queen beds and the third bedroom has two twin beds. Kitchen includes an oven/stove, microwave and full refrigerator. Linens are provided. 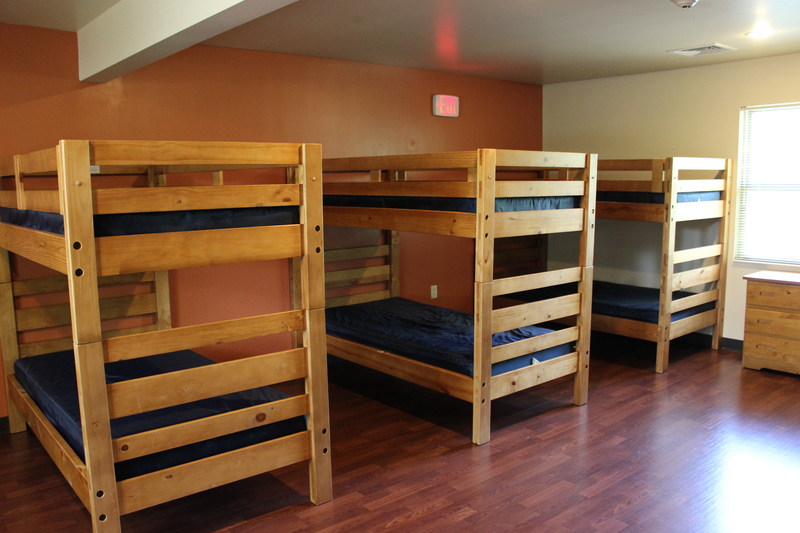 Studio includes a queen size bed and twin bunk bed. There is a kitchenette with an oven/stove, microwave and full-size refrigerator. Linens are provided. Chase Lodge is a six-bedroom cabin with community bathrooms and full kitchen. Each bedroom has two twin beds. One bathroom has two toilets, one shower and one bathtub. The other has one toilet and one shower. Linens are provided. Nicely sized living room which could be used as a meeting space. Dorm style lodge. Each room sleeps up to three people with community bathrooms down the hall. There is a comfortable lounge and sitting area. Linens are not provided. Must rent at minimum 28 capacity.